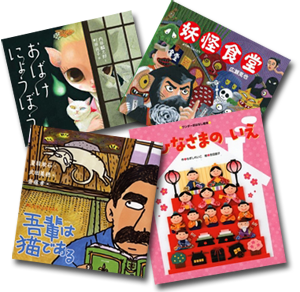 I’ve come across various books that are collections of short stories or essays designed for different elementary school grades, and I think that they might be useful for those of us doing extensive reading in Japanese. Because they’re divided by grade, you already have a good idea of how difficult they’ll be. I’ve read two of these kinds of books; they were both level 3 by my system, but both of them had more content than the average level 3 book, which usually has around 1,000 – 3,000 words: “New Stories That Linger In The Heart for First Graders” had around 5,300 words and “Heartwarming Stories for Second Graders” had around 4,700. So at least at the lower grades, one of these books will most likely last you longer than an average book. They seem to be fairly widely available (I haven’t checked every book on my list, but Kinokuniya had both of the books that I’ve read), not too expensive new, and if you can get them used many of them are extremely cheap. They’re divided into different stories by different authors, so one book gives you not just varying subjects to amuse yourself with, but also examples of how short stories in Japanese are written and what different writing styles are like. There are fewer pictures; depending on your reading level this might be a good thing or a bad one, but it does mean that there’s more room for words. There are different kinds of collections: some based on literature, some about science, and even some about ghosts. If you try one book and particularly enjoy it, finding the next book is as simple as moving up a grade or seeing if there are more books at the same grade in a related series; you might also be able to look up other books by an author who particularly caught your attention. Just because these are for kids doesn’t necessarily mean they’re easy: I would recommend that someone new to extensive reading get some experience reading shorter stories or graded readers before tackling even the ones for first graders, because with less pictures and more text, even the book for first-graders I read was on the harder end of level 3.
e_dub_kendo points out that that they have the potential to get pretty repetitive, especially if you pick up some of the more specialized ones like the collections of fairy tales. I’m going to list as many of these series as I can find, but I’ve only read two of these books: if you read any of them, feel free to send me a short review with what kinds of stories it had, what level it was, the approximate number of words and your rating. Also, if you find any other series like these, let me know and I’ll add them. I’ve added Amazon links because it’s easier to collect them all in one place this way, I like to be able to see the covers and I certainly wouldn’t complain if someone used the links to order through (as an affiliate I get a percentage), but check around for the most cost-efficient way to buy before you actually order any of these, because the odds are good it’s not Amazon. Click here for suggestions on where to find these books. Click here for other suggestions on where to find these books. I haven’t read any of these, but Kanjiguy highly recommended the one for first-graders. Each story was about 2-3 pages long, so with 183 pages that’s quite a few stories! Fembassist has been reading these, and says they’re mostly short stories from Japan. This series isn’t completely available yet, but I assume they’ll be going to 6th grade eventually! I guess someone has found that there’s really a market for books like these. I’m posting a day late since I was out of town, but as of Saturday I was at 220,526 words. Didn’t read quite as much as I wanted to during the week, but made up for it on the weekend. Haven’t updated my book lists or sidebar either…. Well, that can wait. I’m excited that this blog has been getting some attention recently! I think the most logical way to promote extensive reading among Japanese learners would be to try to reach Japanese teachers, since they’re in a better position to create libraries available to multiple students and those of us studying on our own have to fend for ourselves. Still, I get the sense that many of the people who have found this blog through Twitter should do even better with extensive reading than I have, provided they can find enough of the right kind of material. I wish I had discovered extensive reading earlier and spent less time puzzling out texts above my level, but that did mean I was exposed to a lot of words, and although most of them didn’t sink too deeply into my mind at the time, many of them were then later reinforced by extensive reading. My impression is that many other people studying on their own have also immersed themselves into listening, reading and so on, and I bet they have their own stores of latent vocabulary that will be brought to the forefront and strengthened through extensive reading. I hope I’m doing a good job explaining what exactly I’m getting at… I was mostly writing this blog for my own reference, and it shows, so I should do more to make it useful to other people. I was rather enjoying having a blog that no one read, though. My paperdoll page gets about fifty times the traffic this one does… Not that I am complaining! Update (June 28): Hey, they’re starting to confirm my theory! ^^ Check out Operation Subarashii: Read More and Extensive Reading meet Incremental Reading, or How to (多読)tadoku without a 日本語 library. I hit 200,636 words last night! I’ve been getting fairly bored of level 3 books, so I brought home books with a wider range of difficulties from yesterday’s trip to Nikkei Bunko. I feel like I’ve been writing about extensive reading more and reading less this last week, so I will probably be fairly quiet this week. The Read More Or Die Tadoku Contest registration is open, and the contest will start on June 1. The idea is to keep track of how many pages you read by sending the totals to a Twitter bot. I ran across the contest before I even started this blog, but I’m not very competitive so I didn’t even consider joining in. Now that I’ve met some of the people involved in it like LordSilent and Lan’dorien through Twitter, it sounded kind of fun, and I’m in for this round! Emmie has started a bilingual extensive reading community on Goodreads. If you’re interested in extensive reading, join the group to discuss recommendations and meet other tadoku addicts. I added some topics asking for recommendations of Japanese books, so those may be good to keep an eye on. Take some time to think about all the books, comics, movies and so on that you loved as a kid and add those to the other recommendation threads! I decided to try to start an extensive reading group through the Tacoma Japanese Language and Culture meetup group. Two people came to the first one, and they were both beginning readers, so luckily the level 0 graded readers I had ordered had arrived by then, and both of the people who came really enjoyed them. Since then, the other levels (which I bought used from Lan’dorien) have also arrived, and I plan to review them for the blog soon. “Don’t use a dictionary when you’re reading” is the first of the three extensive reading principles my friends told me about — and yet it took me months to stop using one. I rationalized it, telling myself that I remembered words and their associated kanji more efficiently if I looked them up, that looking up a word on my computer took such a short time that it didn’t break my flow, that with limited access to books I had to squeeze all the utility from them that I could. These things weren’t not true. But the two largest reasons I clung to the dictionary were because I felt intensely uncomfortable when I didn’t know a word and years of formal classes in Japanese and French had trained me to look up everything. When I stopped using the dictionary, it felt like a sacrifice. It didn’t seem like it would actually make that big of a difference, and it felt like I was actively throwing away a useful resource: I stopped only because I had faith in those three extensive reading principles. I can’t really figure out what “noun” and “adjective” are just from a sentence like this — although I start to have an idea about the adjective, and I imagine it to be unpleasant — but there are a limited amount of verbs that make sense in context. Something in the range of “broke” or “smashed” or “crashed,” perhaps? So from one read-through of the sentence, I’m fairly sure I understand one of my three unknown words, and I’ve got a good lead on another. At this point, I assume that if the first one happens to be important it’ll show up again, or that there is a possibility of figuring it out from whatever comes next. Sure enough, a toilet follows the ふろおけ out the window, lending some weight to the idea that this word is related to ふろ. It makes sense, insofar as it makes sense at all. And in this case, the book has pictures, and on the next page there is a lovely illustration of a toilet sailing through the air, soon to join a smashed bathtub. So now I know for sure that ふろおけ is “bathtub” (and I would have been about 80% sure without the picture) and from that, I can conclude that すさまじい, whatever other meanings it may have, at the very least holds the meaning of “the sound a bathtub makes when it flies out of a third story window and crashes on the ground.” That’s not the dictionary definition, perhaps, but it’s a good start. I’ve detailed my thought process here, but when I was actually reading, this was all nearly unconscious and almost instantaneous. This ability to figure things out almost immediately from grammatical context, surrounding words and pictures is what I got in exchange for sacrificing my dictionary habit and my pride. The dictionary would have delivered the same result in about the same time frame (assuming I didn’t get distracted by checking Twitter), but relying on it never gave me an opportunity to develop those skills. I also think that practicing on short, simple sentences made it easier to guess words, again aiding in the skill development. When I first started reading without a dictionary, I felt as if I was just reinforcing the vocabulary I already knew and not learning new words, and I felt uneasy about the idea that I was just staying in place. (I even wrote about it in my first weekly update.) At first, as a bargain with myself, I would look up words after I finished a book. Later on, I would look up some words after I finished a book. Now I look up words only if I really liked the book or I was particularly curious about the word for some reason. I know I hardly retain everything I figure out in this way, but I do feel like I remember enough that I don’t worry about whether or not I’m learning enough vocabulary. The only thing I miss about using a dictionary is making the connections with kanji. For example, すさまじい is also written 凄まじい. I know 凄い, so that’s another clue I could have used if the word had been written in kanji, and it’s something I would have missed if I hadn’t looked up these words while writing this blog entry. This may not be a problem for those of you who actually memorize on’yomi and kun’yomi properly: I can’t for the life of me remember those readings in isolation, so I don’t even bother trying anymore. Still, as the books I read get more advanced, more kanji starts to appear — which often actually makes them easier. Actually, I mentioned earlier that I guessed that ふろおけ was “bathtub” because the next big noun to appear was “toilet,” but the truth is that I didn’t know the word for toilet before, either. But it happens to be 便器, and it happened to be written in kanji, and so it immediately made sense to me because I’m familiar with both of those kanji already. I often think it’s funny that extensive reading has a large following among Japanese people learning to read English, but because of kanji, the technique is perfectly suited for those of us who are learning to read Japanese! If the idea of extensive reading appeals to you, but you’re hesitant to stop using the dictionary, I hope this will encourage you to give it a try. For me, it’s proving to be a central part of the process, even though I didn’t understand what the big deal was when I first read about the three principles. One of the biggest problems with extensive reading for people studying Japanese is that having ample amounts of reading material is the cornerstone of the whole experience, but it’s hard to get that reading material for those of us not in Japan. Particularly at the beginning stages of learning a language, there’s the twin demons of scarcity and expense: at the moment, if you don’t have a teacher who’s into extensive reading or access to a well-stocked library, there aren’t too many alternatives to buying books, probably online, and that’s an expensive proposition. The cheapest possible way I’ve found to get books so far is to buy them used, have them sent to a friend’s address in Japan, then have your friend box them up and ship them through surface mail. This requires knowing what books you want, which is tough if you can’t see the actual text… That’s why I’m particularly interested in finding series of slightly old books, books with multiple stories in one volume and books that are particularly long for their level. The books should be sent as printed matter, and there’s a 5 kg (11 pound) weight limit (2 kg, or 4.4 pounds, for books sent to Ireland or Canada). Sent through surface mail, which will take 1-3 months, it should be around ¥2700 for a package right at the weight limit. Emmie was able to send sixteen books in one package to me in this way, but it will depend on how heavy your books are — a lot of the ones she sent me were picture books, so were relatively thin. (That package arrived in about a month and a half.) For repaying the shipping fee, you could use PayPal or buy an Amazon.co.jp gift card. Of course, there’s always the problem of finding someone who’ll help you with this. I’m lucky that Emmie is kind enough to do this for me, but even though she’s got a heart as big as a house I can’t exactly volunteer her to everyone learning Japanese! It’s a big favor to ask of someone, and if Emmie hadn’t initially offered, I’d probably still be just thinking about it as a potential plan. I wonder if there’d be a possibility of one of the Japanese buying services out there like J-List or White Rabbit offering collections of cheap used books at various difficulty levels, or about collections of subjects? If there’s a new book you want, it seems that it’s usually just about as cost-effective to buy it from Kinokuniya as it would be to buy it on Amazon.co.jp, because the markup isn’t generally too bad and shipping is reasonable (and is even free if you buy more than $100 at once). (Shipping new books directly through Amazon.co.jp is pretty darned expensive: ￥2,700 per shipment of books/videos to North America, plus a ￥300 handling charge per item.) YesAsia is also a possibility; their prices are usually higher than Kinokuniya’s, but they offer free shipping starting at $39, so depending on how much you’re ordering it could even out. I’ve found Kinokuniya’s website to be a little hard to navigate. For example, you can get free shipping if you order $100 worth of books at one time, but those books all have to be from the same store. So if you ordered $50 of books from the Seattle store and $50 of books from the San Francisco store, you wouldn’t get the free shipping. However, you can’t search for book availability by store, so if you were bent on getting that free shipping you would have to keep directly searching for books you wanted until you found enough of them at the same store. Luckily, regular shipping isn’t horribly expensive. You can also special order books, and as I understand it, you can direct them to ship all of the special ordered books at once, meaning you should be able to combine the shipping. However, I haven’t ordered anything from Kinokuniya online yet; when I do I’ll write more about it. Kanjiguy suggested bk1, which is based in Japan and all in Japanese; it offers more shipping options than Amazon does, and there’s no handling fee. Read through the shipping options before placing an order, if you go with them, because shipping overseas seems to be calculated only after your order is complete, so you can’t compare the final price effectively. I’ll leave it there for now; if I’m missing something about either of these methods, or if there’s a cheaper way of getting books that you can think of, please let me know! There’s some books right at my current reading level, some above it and some picture books, which I’m glad for because I’m going to try to start some extensive reading groups in this area and nicely-done picture books are always good to have around! It was fantastic, and it really made me feel lucky not just to have found out about extensive reading, but to have met so many wonderful people in the process! If this wasn’t enough evidence of Emmie’s kindness, she’s also allowing me to use her address, so I can buy used books online and have them sent to her, then she’ll send them over to me and I’ll pay her back for shipping. I will write more about this process, exactly what the costs are and so on. In the meantime, I’ve ordered fifteen books, and am looking forward to seeing them arrive at my door! As for my actual reading progress, I’m up to 176,441 words, and I’m starting to think I may get bored of level 3 books before I hit 200,000. This is a list of all the Level 6 books that are part of my own collection; it’ll be updated as I keep reading (and buying) them. I’ve added Amazon links for the benefit of having title images and just in case anyone wants to subsidize my reading, but if you’re interested in ordering any of these, I’d also recommend you look them up on Kinokuniya’s website or YesAsia.com and compare prices and shipping costs. They may also be available at a library near you or be available through inter-library loan; you can look them up at WorldCat.org. Finally, if you’re in the Tacoma area, I’m setting up a weekly extensive reading group through the Tacoma Language and Culture meetup group; feel free to join the group and come read any of these! Also, all title translations are my own unless otherwise indicated, names are family name first, then given name, and 作 and 絵 mean “author” and “illustrator,” respectively. This is a list of all the Level 5 books that are part of my own collection; it’ll be updated as I keep reading (and buying) them.